Meet Dr. Jerry Huerter, Jr. I form partnerships with my patients and instead of dictating a certain path, we work together to find solutions that work for them. No two people are alike. And no two orthodontic treatment plans are exactly alike, either. I know there is no universal “right way” to treat each patient, and I understand that even in patients with similar orthodontic issues, dramatically different treatment approaches might be required. This is why it is essential to explore all options for care and to develop treatment recommendations based on an individual’s unique needs. I come from a family of orthodontists; in fact, you might say that smiles run in my family. I am a second-generation orthodontist, and my father, Dr. Gerard Huerter, Sr., who has now retired, started this practice in 1964. My uncle, Dr. Ron Huerter, and my two cousins, Dr. Dan Huerter and Dr. Tom Huerter, are orthodontists, too. Growing up, I watched my father treat his patients, and saw the friendships that developed between him and those he cared for, and I knew that this was the field for me. Being able to make a positive, life-long difference for those in our community, not just improving their oral health and straightening their teeth, but helping improve each patient’s self-confidence and self-esteem by creating beautiful, unique smiles, is very rewarding. Nothing makes me happier than to see my patients proudly display their new smiles after their braces have been removed! I graduated from Rockhurst High School and attended Kansas University for my Bachelor of Arts. Then I went to the University of Missouri Kansas City School of Dentistry where I was awarded my Doctorate of Dental Surgery, followed by a Master of Science in orthodontics from St. Louis University Center for Advanced Dental Education. Once I’d completed my degrees, I knew I had a solid foundation in orthodontics, but in an ever-changing field, I also knew it was imperative that I remain up-to-date on new technologies and treatment modalities. I regularly seek out continuing education offerings in order to stay on the leading edge of oral healthcare developments, so I can provide my patients with the most current, proven options. They deserve the best. To offer anything less is not acceptable. In 1990, I married my high school sweetheart, Paula. 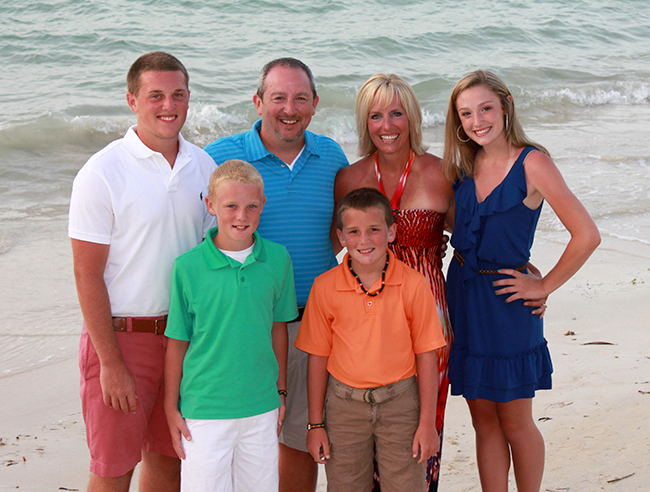 We have four wonderful children — Garrett, Courtney, Grant, and Carson — who keep us very busy. Our family also includes two dogs, Marley and Porter. My family is my highest priority and I spend much of my free time with them, with most of my weekends spent at sporting events where I watch or coach my children’s teams. I also love to play golf, scuba dive, and travel with my family, and am active in my church. I am an avid Kansas Jayhawk fan and love James Bond movies.